Soups have long been the mainstay of any cook who is trying to stretch the larder to feed more people, or the budget to save money. Soup is the basic survival food. 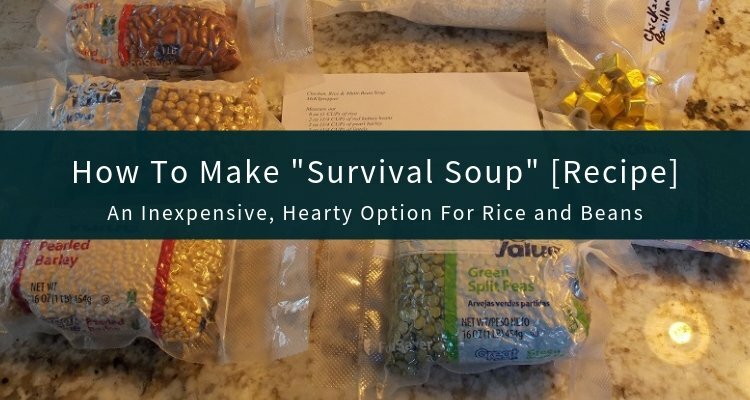 This is the first in a series of Survival Soup recipes that you can make from commonly stored foods, your garden in season, foraging wild edibles, or what is seasonally plentiful on the homestead. Don’t have time to prepare and cook soup? There are some really great dry soup mixes available. Oregon Lakes has 15 different recipes, and is all natural. See all their flavors here. Put the ingredients into 6 quarts of water, bring to a boil and then simmer for 2 hours. When I cooked this it didn’t thicken up for me in two hours, but once I turned the burner off and let it sit for a while it did thicken up into a very hearty soup! If you decide to make this soup, I would suggest going to 1/4 to 1/2 of the recipe and adding liberal amounts of salt and chicken bouillon. Think of it as a very hearty chicken and rice soup with beans, etc. adding protein. This is a very basic recipe that you can add nearly any meat, including jerky, too. It will fill your belly and stick to your ribs. MsKYprepper said it is especially good with cornbread. I bought all of the ingredients (3 lb. bag of rice and 1 lb. bags of the rest) for less than $10 at Walmart. If I purchased it in larger quantities, it would cost far less for the same amount, but I wanted to try it before I committed myself to larger quantities, and I’m glad I did! If necessary, I’m pretty sure it would feed us (2 adults) for at least a week, maybe two! No, it may not have all the calories you need, but it is meant to be a base for your foraging other foodstuffs from your garden or wherever. 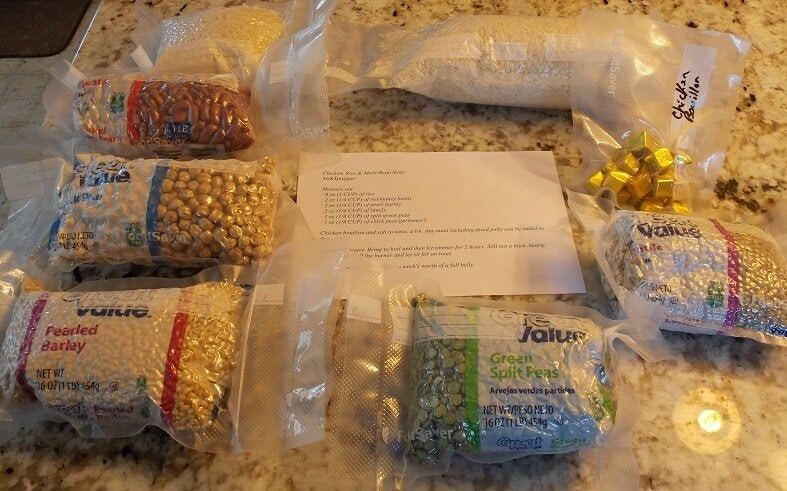 I decided to vacuum seal this, with the recipe, as a gift for one of the kids, to start them on emergency food storage. 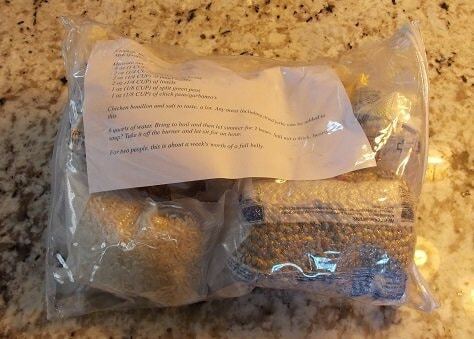 Then, to keep it all together in a package they could stash almost anywhere, I put it in a clear baggy that I got with some sheets I just bought – I love to repurpose things! If you make this soup, please come back and tell us how you would dress it up for variety.